Nowhere Boys: The Book of Shadows will premiere on the big screen in January 2016 with one massive story and even more action and adventure than ever before. 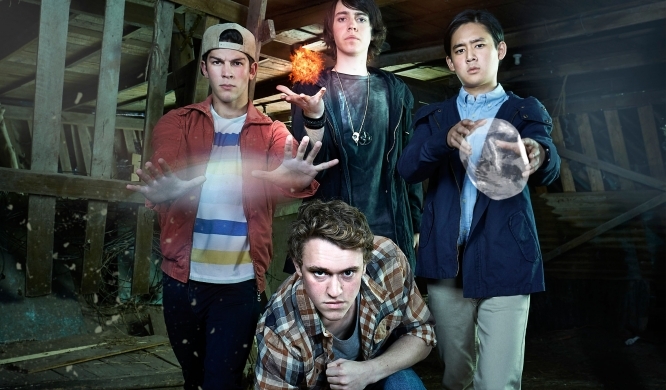 Having crossed dimensions, discovered magic, and battled demons in two ABC Television seasons, the Nowhere Boys – Felix (Dougie Baldwin), Andy (Joel Lok), Sam (Rahart Adams) and Jake (Matt Testro) – are back home in Bremin. On the verge of separating forever, they are drawn back together for one final spell when Felix discovers a magically sealed Book of Shadows. Unknowingly the spell releases a powerful force of chaos and revenge that threatens their world and all they love. The acclaimed ABC3 series began when the four mismatched teens got lost during a school excursion and reemerged in a parallel world that they had never been born in to. Ultimately the Nowhere Boys found their way home, with new and unpredictable powers. The talented cast are Rahart Adams, star of Nickelodeon’s Every Witch Way and the new feature film Liar, Liar Vampire; Dougie Baldwin from ABC TV’s Upper Middle Bogan; Joel Lok who received the IF Award for Best Actor for his role as young Tom in The Home Song Stories; and Matt Testro who’s first feature film Eden hits US cinemas later this month. Rising star Angourie Rice joins our four lead boys. Rice first came to the big screen in These Final Hours and will next be seen in US feature The Nice Guys alongside Ryan Gosling. Returning for the movie are series regulars Darci McDonald (Ellen), Sean Rees-­Wemyss (Oscar), Michala Banas (Phoebe), Victoria Thaine (Alice), Ben Keller (Bear), Tamala Shelton (Mia) and Michelle Gerster (Viv). Produced by Beth Frey for Matchbox Pictures, the film is directed by David Caesar (Dirty Deeds, Idiot Box, Mullet) and was created by Tony Ayres (Cut Snake, The Slap, Glitch) and written by Tony Ayres, Rhys Graham and Craig Irvin. The series Nowhere Boys and its team have collected over 15 international and local awards, including the TV WEEK Logie Awards in both 2014 and 2015 for Most Outstanding Children’s Program, an Australian Teachers of Media (ATOM) Award Best children’s Television Program, an Australian Academy of Cinema and Television Arts (AACTA) Award Best Children’s Television Series, the PRIX JEUNESSE International 2014 Youth Jury Prize and a nomination for the Third International Emmy® Kids Awards. Nowhere Boys – The Book of Shadows will be released theatrically by The Backlot Films in association with Matchbox Pictures on 1 January 2016. The movie will have its television premiere on ABC3 soon after. Tony Ianiro from The Backlot Films said: “To work in collaboration with Matchbox Pictures representing their film during the biggest box office period of the year is incredibly exciting. Nowhere Boys – The Book of Shadows like Paper Planes and Oddball, is an example of a locally made family film which will appeal to audiences during the summer holiday break and stand proudly alongside the tentpole blockbusters released during that period”. Nowhere Boys: The Book of Shadows is produced by Matchbox Pictures in association with the Australian Broadcasting Corporation, and with the financial assistance of Screen Australia, Australian Broadcasting Corporation and Film Victoria. It will be distributed internationally by NBCUniversal and in Australian and New Zealand (Non-­‐theatrical) by the Australian Children’s Television Foundation.